There was quite some hate heard in engineering communities regarding Batteriser : product claiming to extract "up to" 800% more power from the battery. 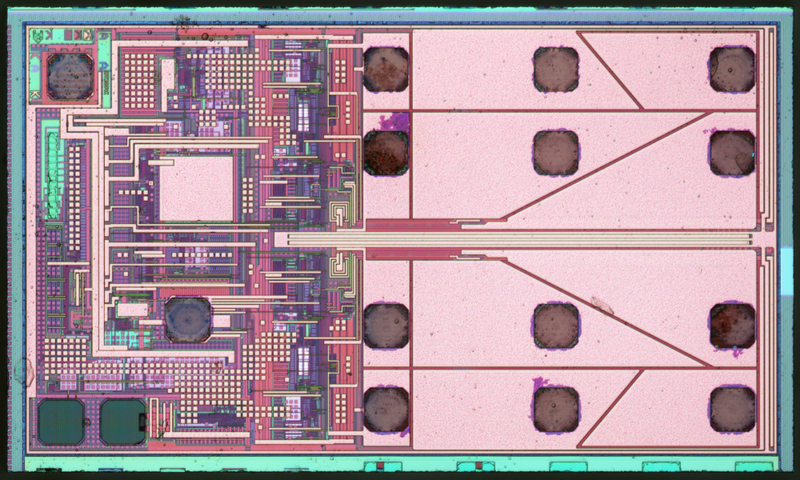 It's a thin sleeve with 1 active component - BTR004 chip. This is a boost DCDC chip with external capacitors and inductors. Chip itself is not all that dumb - it's a custom job (see BTR004K marking at the top left corner), with very low quiescent current and apparently able to drive large range of loads. More than half of the chip area is occupied by 4 MOSFETs. Most likely they are connecting SW1/SW2 pins to ground/output - so we have SW1->ground, SW1->VO1, SW2->ground, SW2->VO2 MOSFETs. Looks like synchronous 2-phase boost converter. While Batteiser/Batteroo as a product itself is almost never useful (with rare exceptions of badly designed electronic goods consuming low current with unusually high cut-off voltage and/or absolutely no or very bad voltage regulation), chip itself could have been useful as a standalone product, especially if higher output voltages were available. Technologically it's quite advanced product spoiled by marketing and product placement. Thanks for the chips to DextersLab2013 (blog, YouTube), guys at EEVBlog forum and of course David Jones for rising this issue in the first place.